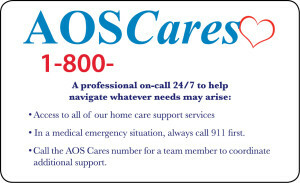 AOS Cares is a program designed to provide our clients with access to one of our team members day or night for support. There may be times when an older adult has someone else acting on their behalf. Because of this, the AOS Cares program works closely with those who are in your support system. The AOS Cares contact number should be given to other people who are involved in your life. I have a loved one who is a client of Aging Outreach Services. What I most appreciate about this organization is the attitude of respect for its clients which is demonstrated in the caring way services are personalized for the individual. Much attention is paid to helping the client retain as much dignity as possible, even when circumstances make this most difficult. 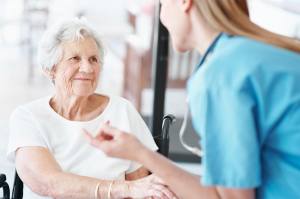 The caregivers are very patient and seem well suited for the task, and supervision is excellent. I also have been pleased with the frequent communications I receive from AOS. Aging Outreach Services was a lifeline for me in the four years between my father’s decline into a difficult dementia and his death. As I live 3000 miles away, I relied on them with complete confidence to keep him safe while he was still at home, and then to oversee his care in several facilities, moving him at a moment’s notice, supplying him, with companionship and provisions, heading off problems, teaching me about his condition, and being my eyes and ears. I was terribly lucky to find them. From my perspective, the things that AOS were able to provide for my father and for our family was compassionate and professional advice on a range of complicated and at times delicate personal, financial, emotional, legal, and medical issues. I know my father greatly appreciated the people at AOS and what they did with him and for him. As none of my fathers family lived in Moore County, we, too valued having someone in Moore County who always put our father’s interests first. I have used Aging Outreach Services for nearly five years. The care managers are always on call and have helped me with many visits to the doctors and hospital. Aging Outreach has given me the confidence to live alone and live in my own house.